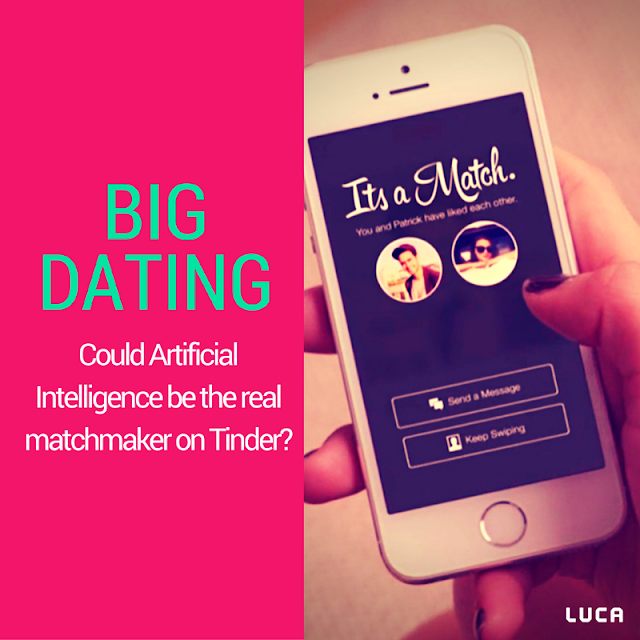 Big Data & Data Science Blog: Big Dating: Could AI be the real matchmaker on Tinder? Big Dating: Could AI be the real matchmaker on Tinder? Online dating platforms such as Tinder, Happn and Hinge are seeing exponential growth, slowly sliding on to the home screens of smartphone users all over the world. Last week at the Web Summit in Lisbon, Tinder's CEO, Sean Rad, presented about just how popular the world of swiping and superliking has become, declaring that 80% of people on the app are actually searching for "serious relationships". He also shared that 85% of users are Millennials and that 1.4 billion swipes take place every day, creating 26 million daily matches. Figure 1: Could Artificial Intelligence be a game changed in the world of online dating? However, the massive popularity of turning to online forums to meet potential suitors can cause great frustration for many. In a world where we can digitalise and automate so much of we do, some find it to be too time-consuming, whilst some just get bored of the generic icebreaker conversations. So, what if Artificial Intelligence could relieve online daters of the daily monotony of searching for the perfect match? What if they could invest that extra hour in cooking their favourite recipe or hitting the gym ahead of any potential date? Well, with Bernie, they can. Figure 2: An overview of Bernie's functionalities in the online dating world. 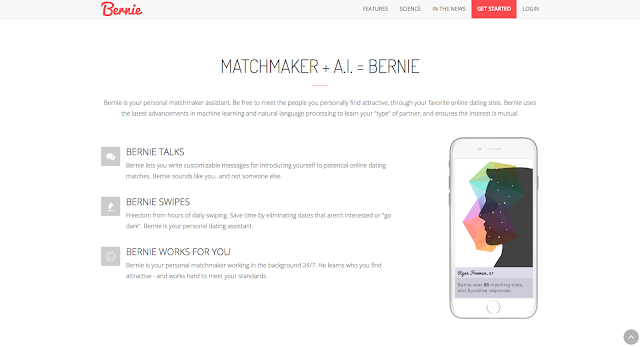 Bernie, otherwise know as "Personal Dating Assistant AI", is a startup based out of Vancouver and aims to take the friction out of online dating. This bot lets you write customizable messages introducing yourself to potential candidates, "sounding like you, not someone else". He also provides "freedom from hours of daily swiping", saving users time by eliminating dates who won't work out. Furthermore, he also learns who you find attractive "working hard to meet your standards." The solution relies on both Artificial Intelligence and Deep Learning and the founder reported their number crunching in this blog post, revealing that out of a sample size of 164,519 efforts (actions or events by Bernie), users only reverse Bernie 225 times, giving them a remarkable feedback accuracy of 99.86%. However, whilst Bernie may entertain the serial online dater, how will the potential "victims" feel when they find out it was a robot and algorithms who actually discovered their "unique" profile on online dating platforms? Well, the founder claims that his countless hours of research, experimentation and bug-fixing have been worth it as he has now found a girlfriend - who did not see any problem with his data-driven approaching to dating. On a more negative note, Tinder is also suffering from an invasion of trained Artificially Intelligent chatbots trying to trick users. Candid Wueest from Symantec explained that "the reason they exist is because somebody, somewhere is making money out of them" in an article in El Confidencial. These bots do this by driving traffic to commercial websites where they try to get users to suscribe to premium services, sharing their credit card details which can be used by potential fraudsters - all in their innocent pursuit to find love. 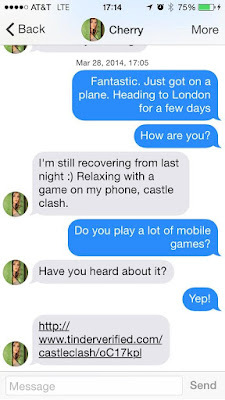 Figure 3: An example of a Tinder Bot tricking a user to visit a gaming website. A similar case also took place when someone used Tinder to collect Uber referral credits, which was also against Tinder's terms of service. As more and more of these cases emerge, it's clear that one of the greatest challenges for online dating platforms is learning to co-exist with AI and bots, as innocent or dangerous as they may be for users. As well as protecting their users, they also have to ensure they are themselves integrating AI within their applications to make online dating smarter - so that users don't even feel the need to download Bernie in the beginning. If they achieve that, then perhaps Sean Rad's number of daily swipes may drop in the years to come.